This handsome, unisex scarf features a herringbone stitch with a moss stitch border. This pattern is suitable for beginning knitters. 09/23/2008: I seem to have overridden the corrected version of the pattern by accident during an update. If you downloaded this pattern between 07/11/2008 and now, please download and use this version instead. I’ve also updated the link to KnittingHelp.com. 01/06/2007: Error in herringbone stitch w/moss stitch border pattern fixed. 01/05/2007: Notes added for clarity. A note on yarn selection: This pattern uses a stockinette-based stitch and thus has a strong tendency to curl. If using Rowan Cashsoft DK, you may wish to block and iron the finished scarf to reduce this tendency. If substituting yarn, it’s recommended to choose a yarn that is mostly natural fiber. In addition, the zigzag/striping effect will show up best in a yarn with good stitch definition and a bit of sheen. I am doing this pattern for the first time and the numbers dont add up. Am I doing something wrong? I casted on 49 stitches. I did the herringbone stitch w/moss stitch row 1 and there was one stitch remaning. What am i doing wrong? I don’t know exactly what you’re doing, but hopefully this will help you work the numbers out. When you start the herringbone w/moss stitch border pattern you should have 49 stitches. You’ll be doing the six-stitch repeat 7 times total, for 42 stitches, and make sure not to forget the k1 after you finish the repeats before you go back to the moss stitch border. I’m just about to start the pattern but I have a question about the fringe. I might have missed it but I couldn’t find anything on how to add the fringe in the pattern. Should it be added before you start the scarf or after the scarf’s been finished, and how do you add it? Hi. I’m just about to start this project and had a question. What blocking method did you use? In your pictures the scarf looks almost completely flat. Most of what I have read has been wet and steam press blocking. How does that continue the Moss Stitch pattern? Any thoughts? Is there a correction? Am I just not getting it? line of the pattern is for both rows 2 and 4. Row 2 (WS) is purled all the way across. Row 4 is also purled all the way across. Is this the revised pattern? I’ve tried to follow the pattern, but no herring bone pattern appears. That is not an error. The moss stitch border only encompasses the first THREE and last THREE stitches of each row. Row 1 ends with k1, p1, k1, p1. The first k1 in that belongs to the herringbone panel. The p1, k1, p1 belong to the moss stitch border. Row 3 ends with k1, p1, k1 to finish the moss stitch border. Do you think that this scarf would be best using a wool acrlic blend or you think that a 100% alpaca (baby) in dk would work as well. I’m only starting in knitting, teaching myself, and it is hard for me to judge yarn to patterns to how something will wear when done (drape/sage/hold shape). Any help would be nice. Thanks. I’m really excited to make this for a good friend for Christmas. I wouldn’t consider either of those yarns to be ideal for this pattern. You’ll have a hard time blocking the wool/acrylic blend if it’s more than 20% acrylic. Since this scarf is a stockinette-based pattern, that means it will want to keep curling up on itself. The 100% alpaca would be easier to block flat, but alpaca is fuzzy and I’m afraid that might obscure the pattern. This pattern really works best with a smooth and a bit shiny yarn. Is the Rowan Cashsoft DK very soft? I live in the boonies so I would have to order it on-line and have no retail outlet near here where I could “feel” for myself. I really would like the scarf to be super soft and not scratchy. I just opened my Knitpicks e-mail for their new “gloss” DK it is 70% Merino and 30% Silk, looks nice *smiles*. Out of those two yarns, I’d go with the Knitpicks gloss DK. The Rowan Cashsoft is very soft, but it’s also 40% microfiber and doesn’t block well. I don’t understand why you say alpaca is fuzzy! That is clearly not true. I don’t know where you get your yarns, but mine are all worsted spun, very smooth and shiny and give excellent stitch definition. It does lay very flat and has wonderful drape. I feel it is very wrong of you to make such misleading statements about a great fibre for this scarf. You do a disservice to other knitters that simply have never experienced this wonderful yarn. With all due, respect, Tallguy, alpaca can be quite fuzzy. Just look at the middle pictures on this post. You can clearly see the halo and bloom around the 100% alpaca yarn. This is a characteristic of many alpaca yarns on the market, even alpaca blends. I say alpaca isn’t suitable for this pattern because to get the shiny/striping effect from the herringbone, it works best if the yarn doesn’t bloom much. I didn’t say alpaca is a bad fiber, but it is not what I would recommend for this pattern. There are many patterns out there that take advantage of the wonderful properties of alpaca. This isn’t one of them. I’m knitting this scarf right now. I’m using Caron Simply Soft and #8 needles and its turning out great. Thanks for the beautiful pattern! If the last row of the moss stitch is WS purl, shouldn’t step 6 be RS knit, bind off? Am I missing something? Thanks, love the pattern. Ooh, you’re right! I think I actually meant that to be (RS) Purl, so that the bind-off row would create a row of purl bumps to match the purl bumps created by the long-tail cast-on. Though (RS) Knit would be just fine. I love your pattern but am confused about one thing. In row 3 of the moss border and herringbone stitch I only count 48 stitches. Row 1 worked fine for me because after the herringbone repetition there were 4 stitches to wrap it up, but on row 3 as there are only 3 stitches I wind up short. Should it maybe be P1 to finish the herringbone pattern, and then k1,p1,k1 to finish the moss border? There are 49 stitches in row 3. There are 4 sts before the bracketed part (k1, p1, k2), then 42 sts in the bracketed repeats (6 sts repeated 7 times) and then 3 sts to finish it off. Wow. All of that figuring and retrying things and it was a simple oversight. I had been starting row 3 with k1,p1,k1, instead of k1,p1,k2. Thanks so much for your help! 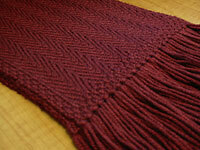 This scarf has a great texture, I love herringbone stitch, I think I might give this one a try! I’m about to start this pattern with a much lighter weight yard. Should I just repeat the (6 st repeated 7 times) until it’s wide enough? Will I run into any potential problems? Thanks. That should work out just fine! Just make sure you cast on a multiple of 6 stitches +1 so the numbers work out right (e.g., 61 stitches or 73 stitches). The border takes 6 stitches (3 on either side). The center herringbone panel is a 6-stitch repeat + 1 extra stitch to finish the pattern. wow, so many probs with this pattern! Add me to the list…It’s just not working out for me — have no idea why. Is it possible to make this a different size? What is the ratio? Is it a multiple of 7 and X?? Also, any way to work this beautiful herringbone stitch — I’m not giving up on it yet! — in the round? Would love to use it in the round. Can you tell me what’s happening when you try to work it? As you can see from the comments above, a lot of people mis-read the pattern where the border transitions into the center panel. Yes, you can make it a different size. Just cast on a multiple of 6 stitches + 1 and follow the directions as written. Yes, you can work the herringbone pattern in the round. Drop off the 3 border stitches on either side and knit the even-numbered rows. Note: response was edited on 1/3/2012 because Emily S found an error! Hey, thank you, Yvonne. It’s not often one gets replies back :^). I figured out what the problem is — for me, anyway, and perhaps for some others: For a krl increase (the one called for here), there is, of course 2 stitches worked — the one created and then the knitting of the stitch from which it came. When instructions then call for “k2,” it does not indicate whether that first k of the k2 is an entirely new stitch, or the knitting of the stitch from which one created the new stitch…Wow, hard to put into words! Ha. Anyway, maybe this will explain better: After the instruction to “inc1″ it should then read, “K the original/first stitch” or to somehow account for the original stitch, if you know what I mean ?? I was counting the original stitch after the increaset as part of the “k2″ because there was no accounting for this stitch in the instructions. I incidentally came across a herringbone pattern last night, which read to, “m1 inc, then K the original s titch…” then it read to “K2.” This made it clear, and accounted for each stitch: So then I knew that I needed to actually create one more stitch after the increase THEN do the k2. sorry for the wordiness! It’s hard to describe. The instructions for the increase on the last page of the pattern do say to knit the next (original) stitch on the needle as part of the increase. How can I make it clearer? Done with the scarf…thank you! How do you add fringe? There’s a pretty good tutorial for adding fringe here. I would like to decrease the size of this scarf, but I am confused by what multiple of stitches to do decrease it by. In your (Yvonne’s) response to lpales you say to increase/decrease it by multiples of 6 stitches +1. Then in your reply to LiLo you said to increase/decrease by multiples of 7. I always thought that those meant two different things, am I wrong? Which way is one supposed to increase/decrease the pattern? Thanks. ACK, you’re right! It’s supposed to be a multiple of 6 stitches + 1, as in the response to lpales. That response also explains why that works. A multiple of 7 will NOT work unless it happens to also be a multiple of 6 + 1 (like the original cast-on number, 49). I’ve edited my response to LiLo to show the correct multiplier and avoid further confusion. 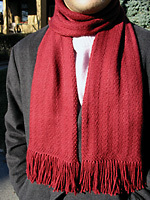 I have finished knitting the scarf which is really very nice. After wearing for 2 times, I find out thar the scarf roll up and become narrow. What can I do? I am using the woollen yarn as you suggested. How can I manage it back to be flat instead of rolling up? It’s a stockinette-based pattern, so it will tend to do that as the scarf becomes un-blocked through wear. To make it flat again, just re-block it.